I have been experimenting lately with recipes for a simple no-knead whole wheat bread and I think I’ve come up with a one that seems to be pretty foolproof and gives consistently great results. Some sourdough purists might object to the use of instant rise yeast in addition to the sourdough starter, but I think for the novice sourdough baker, it insures that you’ll get a good initial rise and excellent oven spring with an amazing sourdough taste. I’m currently using Carl Griffith’s sourdough starter, a strain of starter that is over 160 years old that can be obtained for a FREE at this address. This recipe is adapted from one on the amazingly informative Breadtopia website and solves the common problem of a too “wet” no-knead dough. I recommend watching this excellent video at Breadtopia.com before making this bread…it does a great job of demonstrating the techniques needed to make an incredible no-knead bread. Please click the links below for my recipe. Click here for a printable text only version of the recipe. Click here for the recipe with photos. Your sourdough bread looks amazing! I’ve never tried to make sourdough or any kind of no-knead bread, but now I have to try both. Thanks for the link to Carl’s. Thanks Mary…I actually have a loaf in the oven right now. It’s easy, fun to make and really does taste as good as it looks. 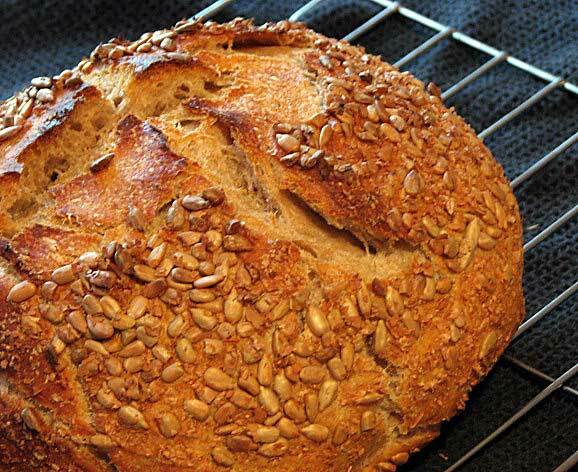 Give it a try…you’ll never buy store-bought bread again! I just got my free starter from the Carl’s volunteers, and will get to work waking that up this weekend. Will make sure to lay in supplies to make this bread as soon as the starter is rarin’ to go. Whee! It’s really great stuff…I know you’ll be really happy with the results..thanks!